(Lanka e News - 20.Nov.2018, 9.00PM) Australia remains committed to protecting its borders, stamping out people smuggling, and preventing people from risking their lives at sea. The Australian High Commission is aware of rumours circulating on social media in Sri Lanka that it is possible to get to Australia illegally by boat. 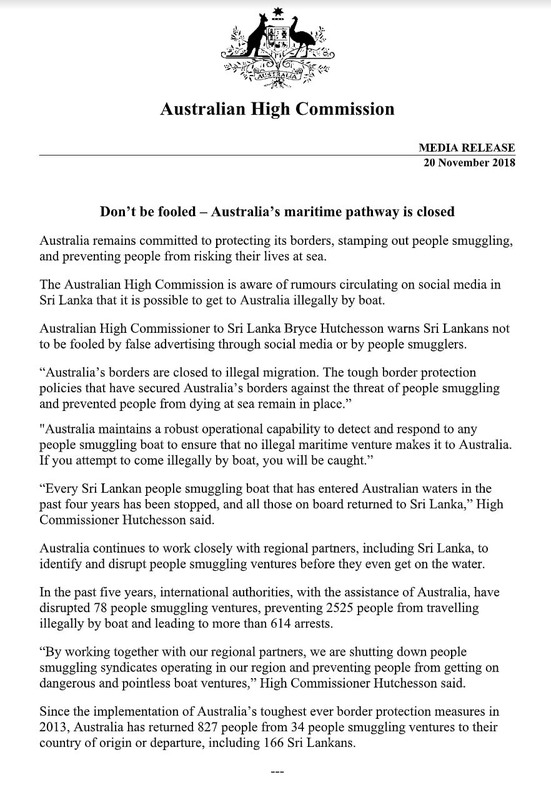 Australian High Commissioner to Sri Lanka Bryce Hutchesson warns Sri Lankans not to be fooled by false advertising through social media or by people smugglers. Australia continues to work closely with regional partners, including Sri Lanka, to identify and disrupt people smuggling ventures before they even get on the water.